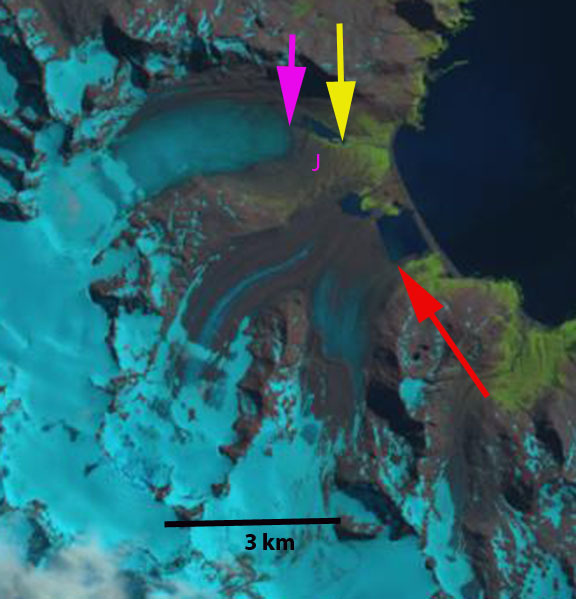 Heaney Glacier and Cook Glacier were merged near the terminus and reached the coast of St. Andrews Bay on the east coast of South Georgia Island in 1975. This is illustrated in a Geomorphology map of the area compiled by Chalmers Clapperton, and David Sugden produced with the support of the British Antarctic Survey, the glaciers terminates along the coastline. Here we use Landsat images to examine glacier change from 1989 to 2014. 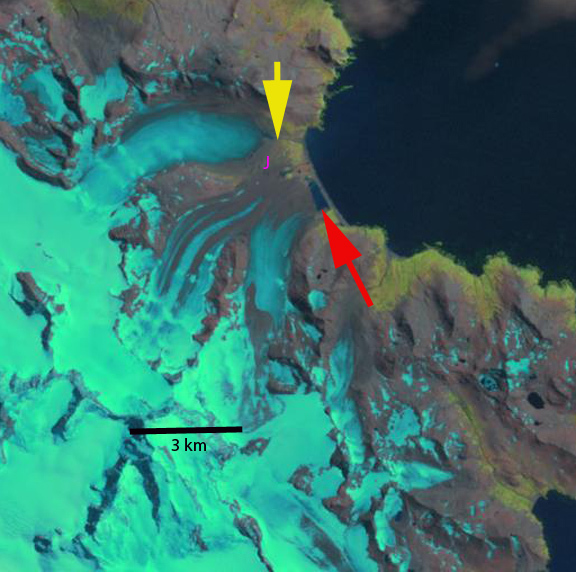 In 1989 Cook Glacier had retreated from the coast, and a small 200-300 m wide proglacial lake has formed at the end of the glacier, red arrow. 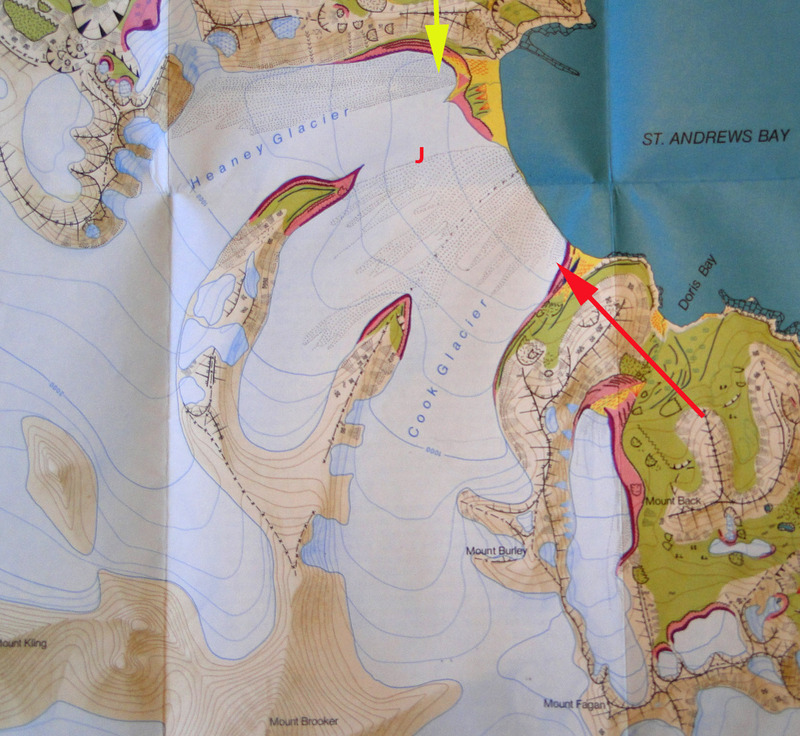 The yellow arrow marks the 1989 terminus of Heaney Glacier in 1989 which is 800 m from the coast, pink arrow indicates 2014 terminus position. Point J marks the junction of the two glacier which is debris covered ice in 1989. 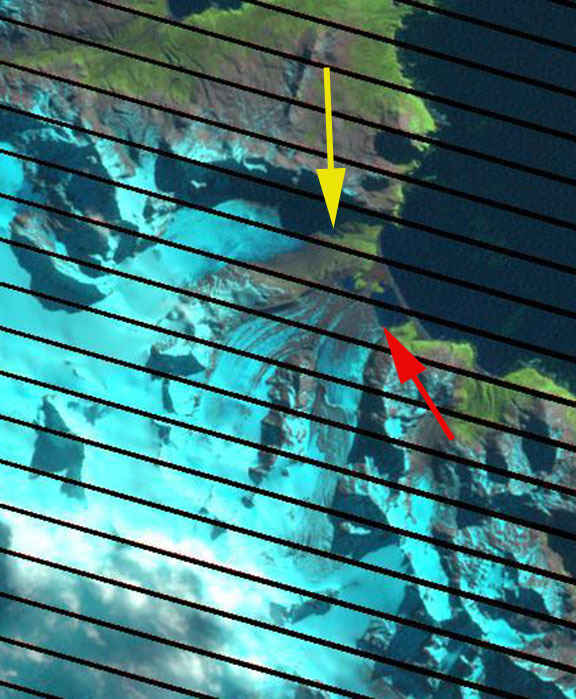 The next image in 1999 indicates modest retreat of both glaciers. 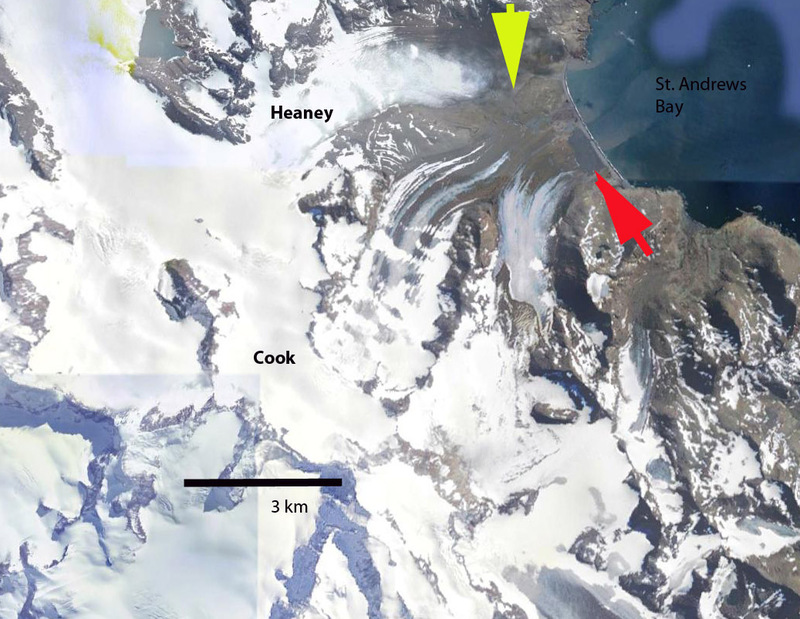 In 2003 Cook Glacier has retreated 500 m from the coastline, and Heaney Glacier is now 1100 m from the coast. 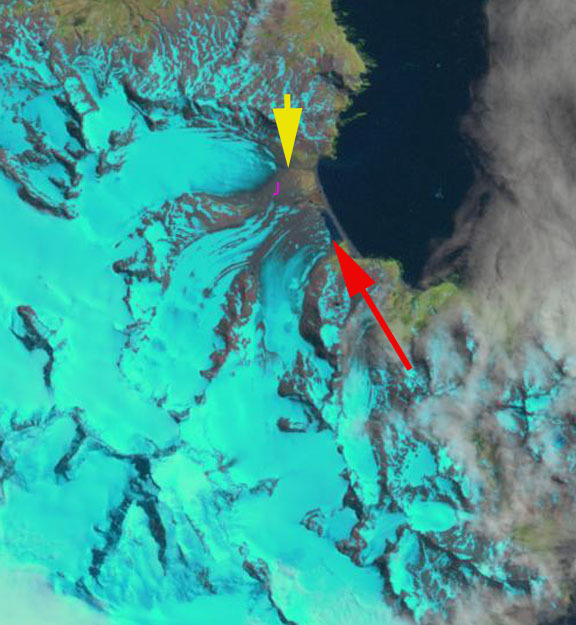 In 2012 a small lake is developing at the front of the Heaney Glacier and the Cook Glacier proglacial lake has expanded to 700 m. In 2014 the narrow lake forming as Heaney Glacier retreat’s is now 600 m long and the glacier terminus is 1800 m from the coast, pink arrow. This is an 1000 m retreat from 1989 to 2014, 40 m/year. Point J is now fully deglaciated with Cook and Heaney Glacier being fully separated. Cook Glacier has retreated 900 m from the coast and 600-700 m since 1989. The proglacial lake, red arrow is 750 across and is still expanding as the glacier retreats. The story at this point is familiar with that of other land terminating glaciers on South Georgia Island, Konig Glacier and Purvis Glacier, with substantial accelerating retreat and lake formation at the terminus. 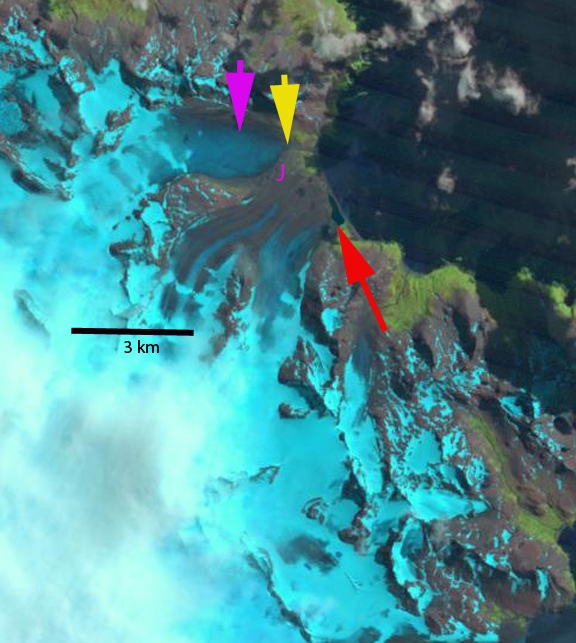 Cook et al (2010) and Gordon et al (2008) have emphasized that this pattern is island wide with many calving glaciers having faster retreat. This entry was posted in Glacier Observations and tagged climate change glacier retreat, cook glacier retreat, heaney glacier retreat, south georgia island glacier retreat, south georgia island proglacial lake expansion. Bookmark the permalink.